HAL Systems software applications are designed with one primary focus – to provide our customers with high value solutions at a lower cost than is commonly available in the marketplace. We work with the same barcode/RFID and scanner technology that is standard in the industry, but that is where the similarities end. HAL Systems accomplishes our objectives with five primary elements. The use of a modern browser-based architecture removes much of the cost complexities of legacy client/server systems. The need to establish and maintain internal networks is reduced and can in some cases be entirely eliminated. The cost of hardware and future hardware replacement is reduced through the use of less sophisticated devices. Future upgrades will not be driven by the need to keep up with device operating system updates. Software-as-a-Service can be easily hosted in the Cloud. The mobile phone networks provide available infrastructure for satellite or mobile locations. HAL Systems solutions are based on a set of configurable elements that can be used to meet specific business requirements with resorting to custom software code. The system features a Glossary that can be used to input the terms that the users see when using the system. The systems comes pre-configured with common terms in English, but users may change any of them to terms familiar to their company. Foreign languages can also be added . Users can configure their own help messages in any language. The systems comes with pre-configured Workflows (sets of transactions that are typically performed in sequence) that are common to many operations. However, the system can be modified to configure the workflows according to the business processes desired by the user. The system allows for the user to define Business rules to prevent transactions that are inconsistent with allowed business processes. The rules are user-defined and easily maintained. When an operator attempts to transact an operation in conflict with a business rule, an error message results and the transaction is not allowed in the system. All transactions made is the system are recorded, including the time/date and user who performed the transaction. Reporting is user-driven using a menu of filters, which can create desired reports without custom report-writing. Reports can be saved for future selection. 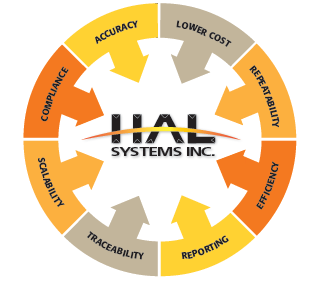 HAL Systems can interface our solutions with any other business systems using our in-house programmers. Typical interface requirements are to ERP/Accounting systems, common carrier shipping systems (UPS, FedEx), other factory automation, or eCommerce portals. We have decades of experience and can develop interfaces to legacy systems as well. HAL Systems has decades of experience across a wide range of industries. We’ve used this knowledge to develop pre-configured solution to many common applications. These solutions are a great starting point for implementing best practice processes developed using Lean/Six Sigma methodologies. All HAL Systems solutions are based on a common software code. Combined with the configurable architecture, we can provide cost-effective solutions to meet any application requirement. We begin with the Basic versions of HAL Traxx Inventory and HAL Traxx Assets for basic requirements. But both versions easily scale to sophisticated features as business needs grow. There is never a need to upgrade software or change platforms with HAL Systems – we can configure additional features when they become required.